After over a year of promises to restore manufacturing to Wisconsin, Foxconn appears to be having second thoughts on who precisely would be employed at the facility. Louis Woo, a special assistant to Foxconn chief Terry Gou told Reuters that the company was still considering what to do in Wisconsin —but that it would no longer be a venue for assembling LCD panels for television, and likely not a giant manufacturing hub at all. "In terms of TV, we have no place in the U.S. We can't compete." said Woo. "In Wisconsin we're not building a factory. You can't use a factory to view our Wisconsin investment." The company still says that there will ultimately be 13,000 jobs created at the facility —but also noted that hiring was slowed. The original pace was to hit 5200 employees by the end of 2020, but the company is currently on pace to have only 1000 by then. 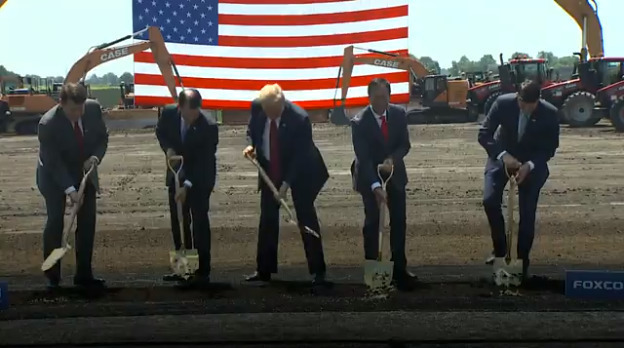 Foxconn has already missed the first wicket for a tax credit. To get the first credit of $9.5 million, the company was supposed to hire 260 people in 2018. Instead, it hired only 178. Woo went on to say that about 75 percent of the jobs generated in Wisconsin are "knowledge" positions, and not the massive factory for blue collar workers that was originally envisioned. While Woo's remarks were on the record, Reuters cited sources familiar with the matter for two more pieces of information about the facility. First, Foxconn's CEO is said to be planning a meeting with Wisconsin's new governor to discuss "modifications of the agreement" —but what that entails isn't clear. Additionally, sources claim that Foxconn may walk away from future incentives that the Wisconsin government is currently on the hook for, should it feel that it is unable to meet the job generation and capital investment mandates in the deal. As part of the deal to open the 20 million-square-foot facility in Wisconsin, a package of $764 million in incentives has been provided by Mount Pleasant and Racine County, the town and county where it will be built. On top of this, the state of Wisconsin pledged another $134 million for the improvement of state highways and local roads near the site. The benefits are in addition to existing financial incentives, which primarily consists of $2.85 billion in income tax credits for job creation and capital expenditures. There is also a sales tax exemption worth $150 million as part of the $3 billion bundle. In return for the incentives, Wisconsin was sold on the deal that was originally going to build LCD panels for televisions. The cited 13,000 jobs was also pitched as beneficial for areas near the facility, including local businesses seeing increased trade and changes in house prices. Foxconn's original pitch for the job creation called it mostly factory workers, accompanied by a much smaller amount of engineers and business support staff. While originally believed to produce large display panels, another possibility raised by Foxconn was construction of small and medium-sized panels due to the transportation risks associated with bigger screens. Considering Foxconn is a production partner for Apple products, and is the owner of iPhone and iPad display producer Sharp, it is plausible that some future iPhone screens could be produced from the Wisconsin facility in the future. In November 2018, Foxconn denied reports that it was shuffling Chinese engineers to the Wisconsin facility, instead of hiring locally.